One out of every eight women will be diagnosed with breast cancer at some time in her life. In all, over 2.8 million women in the U.S. have a history of or are currently being treated for breast cancer. While deaths from breast cancer have been decreasing since 1989, over 40,000 women will die this year from the disease. Everyone knows someone who’s been affected by breast cancer. Mother, daughter, family or friend. We want to help every woman beat this deadly disease. That’s why the Mayo Clinic Center for Individualized Medicine has made researching breast cancer a priority, and why it helped support the following study on the cost effective addition to mammography for detecting breast cancer in women with dense breast tissue. Here is the report on this important Mayo Clinic study. Researchers at the Mayo Clinic Center for Individualized Medicine found that adding MBI to mammography of women with dense breast tissue increased the costs of diagnosis 3.2 times, compared to costs of mammography alone, and nearly quadrupled the rate of cancer detection. Because the supplemental test found more cancer, screening with a combination of mammography and MBI saved $8,254 per cancer detected. While mammography is still the standard tool for widespread breast cancer screening, it is now known to perform less effectively in women with dense breast tissue. Both tumors and normal dense breast tissue can appear white on a mammogram, making tumors hard to detect. 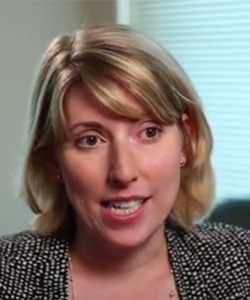 Nearly half of all women over age 40 have mammograms classified as “dense,” according to Carrie Hruska, Ph.D., a medical physicist in the Mayo Clinic Department of Radiology and the study’s lead author. Supplemental screening techniques like MBI address a significant need for better cancer detection methods for this patient population. 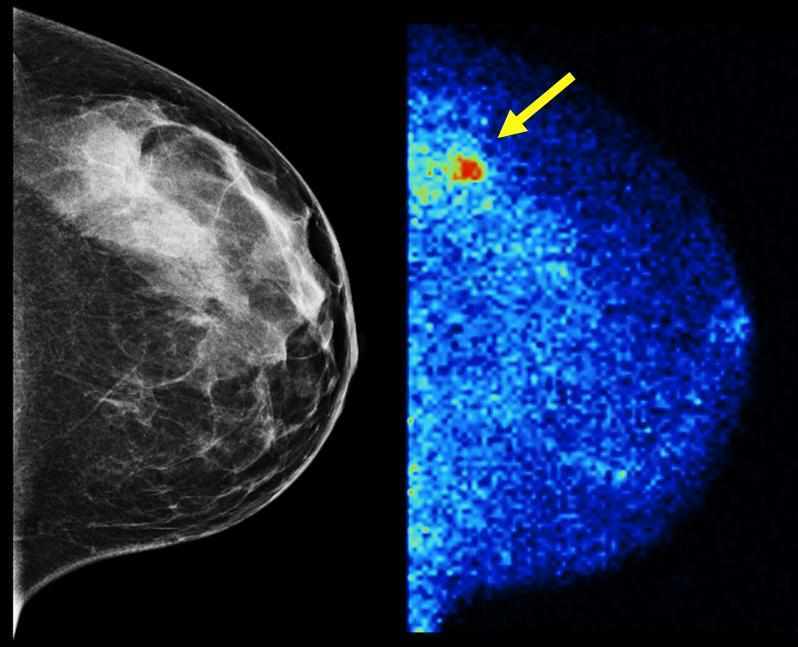 Molecular Breast Imaging (right) detected 3.6 times as many invasive cancers as digital mammography (left) in the latest study of more than 1,500 women with dense breast tissue. About half of screening-age women have dense breast tissue, which digital mammography renders the same whitish shade as tumors. The screening combination of MBI and mammography can detect more cancers than mammography alone at acceptable radiation doses for screening, as the research group reported in a study published in AJR in February. But, concerns persist about the cost-effectiveness of MBI. Though the test finds more cancer in dense breast tissue, additional screening could also generate more false-positive results and lead to biopsies that do not result in a cancer diagnosis, ultimately increasing costs unnecessarily. Cost per patient screened increased from $176 to $571 for the combination of tests. Mammography alone detected cancer in five of these patients. With the combination, physicians detected cancer in the first five women and an additional 14 patients — nearly a fourfold improvement. The cost per cancer detected was $55,851 for mammography alone and $47,597 for the combination of mammography and MBI — a savings of $8,254 per cancer detected. The risk of receiving an unnecessary biopsy because of a false-positive result increased from 0.9 percent with mammography alone to 3 percent with the addition of the MBI examination. However, this 2.1 percentage point increase in the benign biopsy rate is lower than the 6-point increase observed in outside studies using screening ultrasound or screening MRI, two alternative supplemental techniques. The positive predictive value (PPV) of MBI, or the likelihood that a biopsy generated by MBI would result in a cancer diagnosis, was 30 percent. In contrast, biopsies generated by screening ultrasound and MRI have PPVs of 6 percent and 20 percent, respectively. “Cost saving per cancer detected with supplemental screening MBI is compelling evidence for future coverage of screening MBI of women with dense breasts,” the authors write. The study did not consider any costs beyond the point of cancer detection; however, the authors speculate that earlier detection with MBI may reduce the costs of treatment of advanced cancer further. When dense breast tissue is the only criterion for supplemental imaging like MBI, insurance coverage varies from state to state and among insurance providers. 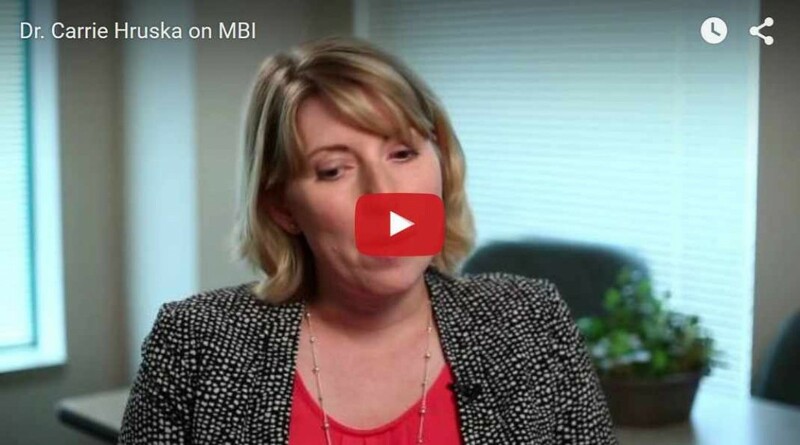 Dr. Hruska calls the latest study a critical step in developing MBI as an individualized screening approach for patients with needs unmet by current options. Dr. Carrie Hruska discusses research findings that show for women with dense breast tissue, supplementing standard mammography with a new imaging technique called molecular breast imaging (MBI) can lower the cost of diagnosis of breast cancers. The study was supported by grants from Komen for the Cure, the Mayo Clinic Center for Individualized Medicine, and the National Center for Advancing Translational Sciences, which is a component of the National Institutes of Health, as well as philanthropic gifts from James L. and Donna K. Barksdale, Mabel W. Brown, Thomas C. and Michelle A. Tiller and other generous benefactors of Mayo Clinic.